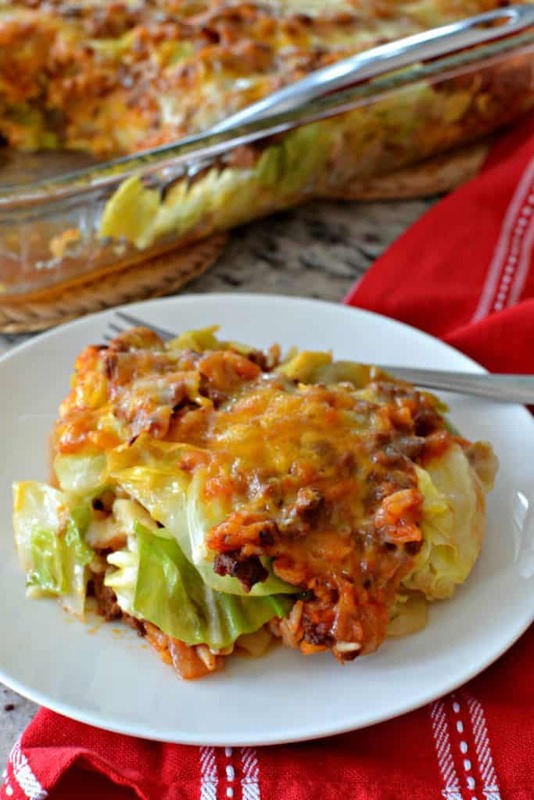 Cabbage Roll Casserole is an easy family favorite. It combines all the delicious flavors of stuffed cabbage rolls with a lot less time and effort. This delectable casserole makes eight healthy servings and leftovers heat perfectly in the microwave. Well the New Year is here and with it comes lots of chores to do. The Christmas tree needs to be taken down and all the treasured ornaments put away until next year. All the Christmas decorations need to be put back in their storage boxes and loaded on their reserved shelves in the basement. The outdoor lights need to be unhooked and wrapped back up in their appropriate boxes. Supper will be here before you know it. 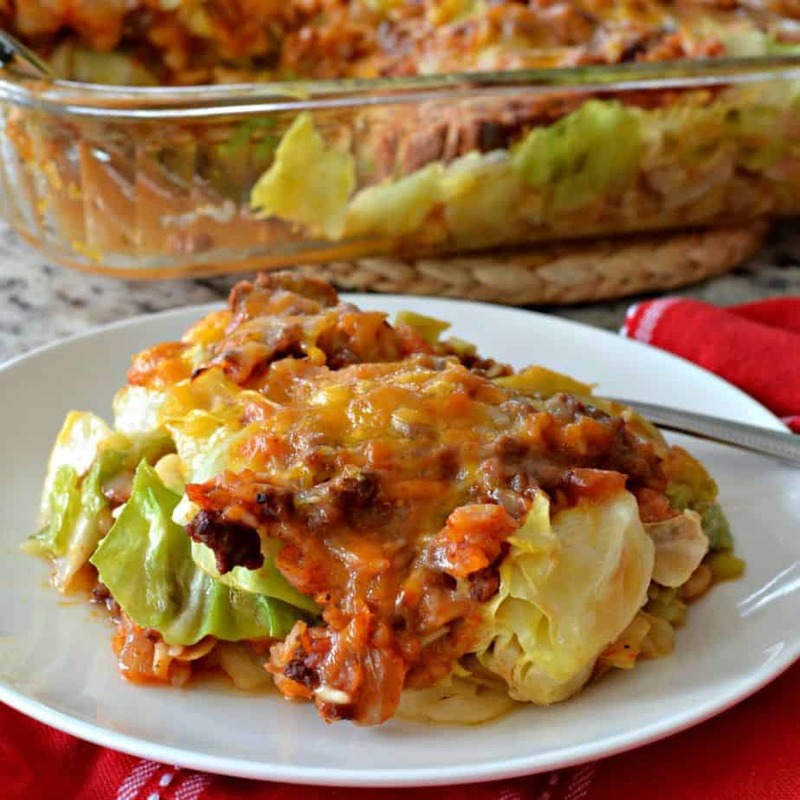 This Cabbage Roll Casserole is quick to come together and tastes just as good or better as the cabbage rolls your Grandma used to make. Just think of it as unstuffed cabbage roll casserole. 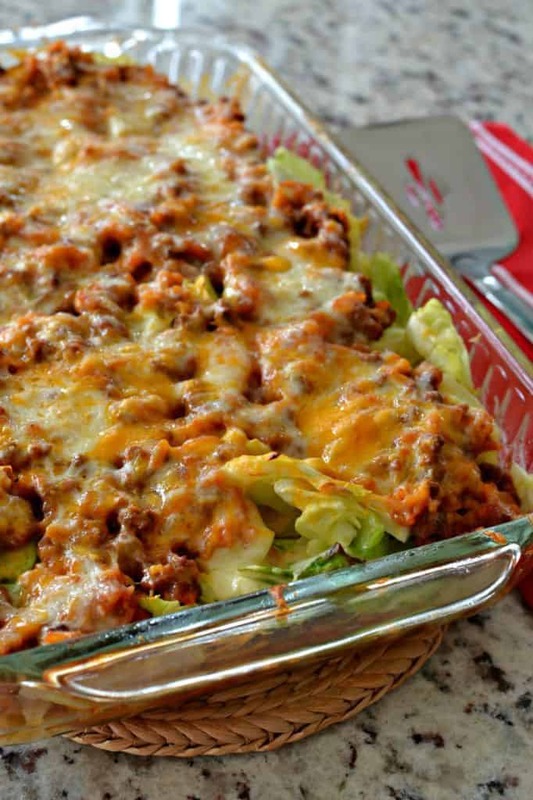 How do you make Cabbage Roll Casserole? Start by browning the ground beef. When it is about halfway browned add the onion and cook until the beef is fully browned. Turn the heat to low and toss in the garlic the last minute of cooking. Drain any excess fat from the skillet. Add the paprika, onion powder, cayenne, brown sugar, tomato sauce, beef broth and rice. Bring the mixture to a low boil and then turn to simmer and cover with a lid. Simmer until the rice is tender. In a separate large skillet add a little olive oil. Add half of the chopped cabbage and cooked until it starts to get tender. Add the cooked cabbage to a casserole dish that has been sprayed with a little nonstick cooking spray. Spread half of the beef mixture on top of the cabbage and top with half of the cheddar and Monterey Jack Cheese. Cook the second half of the cabbage the exact same way and add to the casserole dish. Top with the remaining cheese and bake covered for about twenty minutes then remove the foil and continue cooking until the cheese is lightly browned. 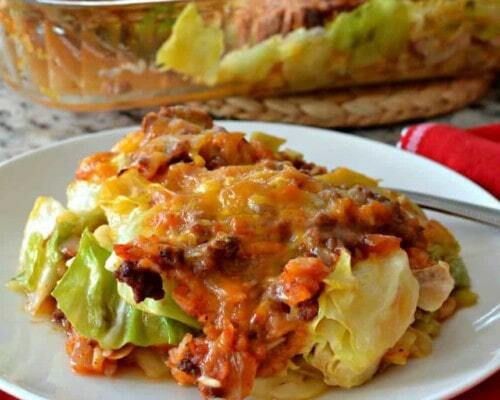 Can Cabbage Roll Casserole be prepared in a skillet? Of course with a couple of easy steps you can have this all prepared in the same skillet that you cooked the cabbage in. You could do it either on the stove top or in an ovenproof skillet. After you finish cooking the cabbage simply layer cabbage, cooked beef mixture, cheese, cabbage, cooked beef mixture and cheese in the skillet. Turn the heat to a low simmer and cover with a lid or foil. Cook until the cabbage is tender and the cheese is melted. 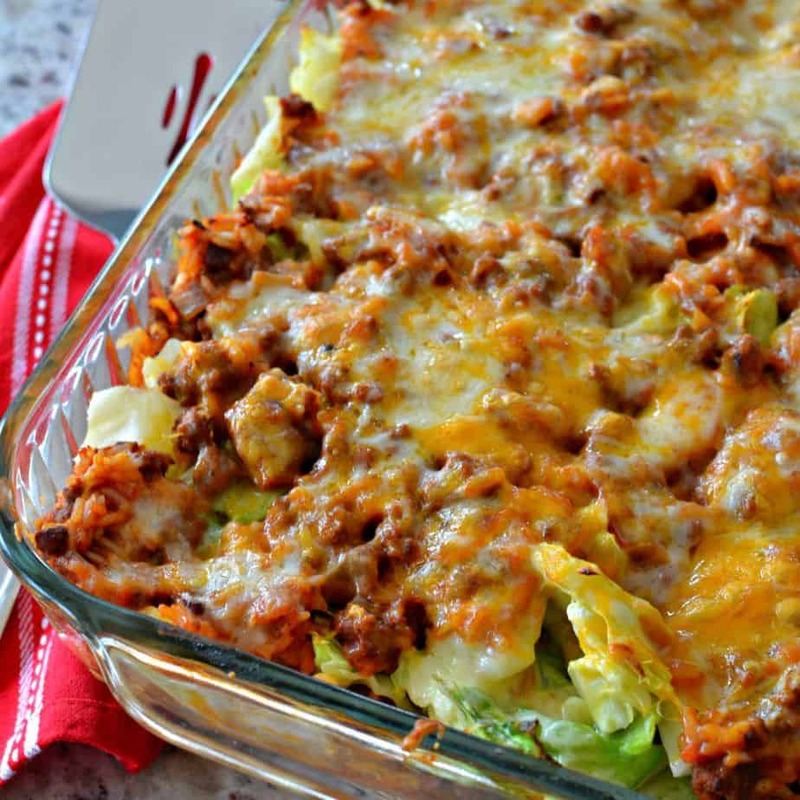 Make sure that your skillet is ovenproof and simply layer the cooked cabbage, cooked beef mixture, and cheese. Repeat the layers ending with the remaining cheese. Cover with foil and bake for twenty minutes. Remove the foil and continue baking until the cheese is lightly browned and melted. Other add ins for Cabbage Roll Skillet. I have lots of readers who like their recipes with a little bit of kick and extra spice. If you are one of them this section is for you! Pick one or two of these to add some pizzazz to the casserole! Of course if you were born with a Habanero Pepper in your mouth go for it. 1-2 tablespoons Cajun seasoning added at the same time as the other spices. 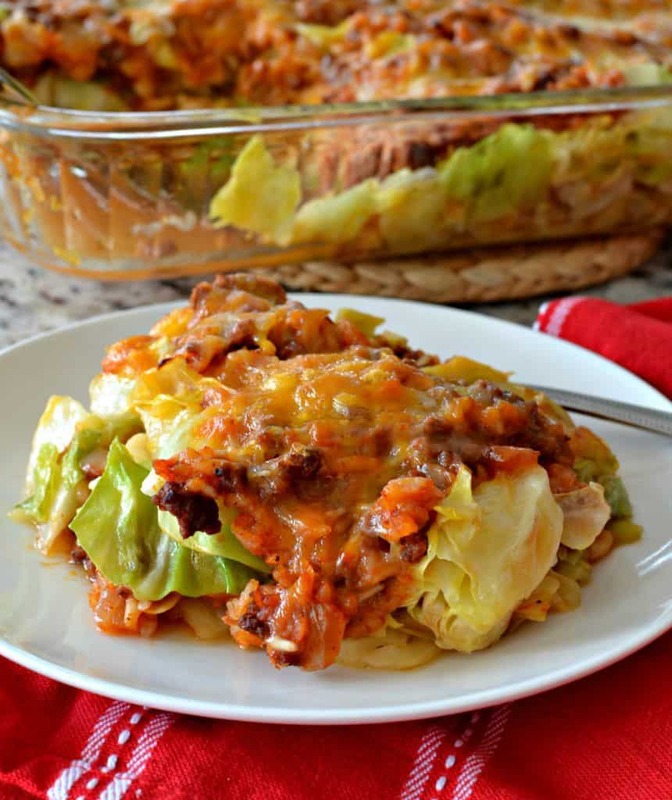 This delectable Cabbage Roll Casserole is family friendly, easy, quick and adaptable to your individual taste buds. Put the ingredients on your shopping list today and make this wholesome casserole for your family. Other casseroles you will love! 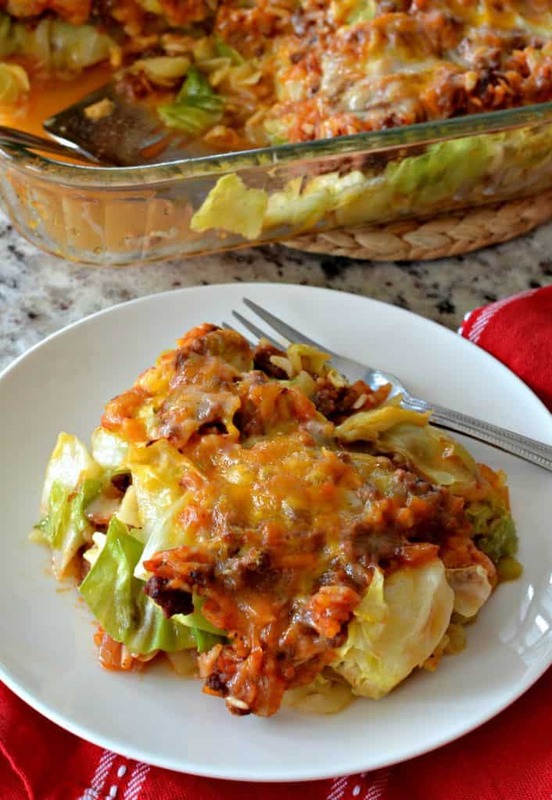 Cabbage Roll Casserole is an easy family favorite. It combines all the delicious flavors of stuffed cabbage rolls with a lot less time and effort. Preheat oven to 350 degrees. Spray 9×13 inch casserole dish with nonstick cooking spray or olive oil spray. Brown ground beef. When the ground beef is about halfway browned add the onion; cook until the beef is fully browned. Reduce the heat to low. Add the garlic and cook for 1 minute stirring continuously. Drain any excess fat from the skillet. Add paprika, onion powder, cayenne, brown sugar, tomato sauce, beef broth and rice. Bring the mixture to a low boil. Turn to simmer and cover with lid. Simmer for 20 minutes until rice is tender. Heat 1 tablespoon olive oil in large skillet over medium heat. Add 1/2 of the chopped cabbage and cook until slightly tender; 5-7 minutes. Spread cabbage over the bottom of the casserole dish. Top with 1/2 of the ground beef mixture. Sprinkle with 1/2 of the cheeses; blending them. Heat 1 tablespoon olive oil in large skillet over medium heat. Add the other 1/2 of the chopped cabbage and cook until slightly tender; 5-7 minutes. Spread the cabbage over the cheese in the casserole dish. Top with the other 1/2 of the beef mixture and then with the remaining cheese. Cover the casserole with aluminum foil and bake for 20 minutes. Remove the foil and bake for another 20 minutes or until the cheese is lightly browned. Can you make ahead and freeze this recipe? I haven’t made this yet but I am going to. I make cabbage soup all the time and freeze it and it comes out fine. However I don’t think you should freeze cabbage before it is cooked. I like to make these types of casseroles and freeze leftovers in single serving size containers for my husband to take to lunch. I will try this and see what happens. Thanks! Please let us know how it turns out. My readers are always asking about freezing. Delicious! I added a can of diced tomatoes to the ground beef mixture. Thanks for a very good recipe! The pleasure is all mine! So glad that you liked it!! Did you use diced tomatoes in place of tomato sauce or in addition to? Delish!! Made this today for tonight’s dinner, I could have eaten the beef and rice mixture alone! It’s not even dinner time yet and my husband has helped himself to two servings! Pretty sure the kids are also going to LOVE it! That is great Cara! I am so glad that you and your family love it! You made my day! Freezes well after cooked. I freeze cabbage rolls in ziploc bags every Fall for the winter. Love a recipe like this for a quick meal as love cabbage! Thanks for the heads up! That is good to know! Wow! I have never seen a recipe quite like this one. I had a menu planned out for tonight’s dinner and a shopping list created but looks like I’ll be rewriting those! Going to try this for dinner tonight! Thank you. How sweet! Thanks Genevieve! I sure hope you enjoy it!! Sometimes you just know when you are putting a recipe together that it is going to be a keeper. This is one of those recipes! In the oven now, smells fabulous & I cannot wait to eat it! I used riced cauliflower instead of rice…& smoked paprika. Thank you! I so hope you enjoy it Alli! We love it!! Can you use bagged slaw instead of chopping cabbage? No it is chopped way too thin. You want larger chunks. This looks like my kind of comfort food! Can’t wait to make this. Thank you! My pleasure. I hope you enjoy it as much as we do! Thank you! I love cabbage soup! So darn delicious!! Is there any way to reduce the sodium in this? Also, would using ground turkey instead of beef spoil the taste or recipe? I think this looks very good, but need to make adjustments in recipes because of husband’s health issues. Thanks so much! It probably does not have that much sodium in it. I use a program to establish nutritional information by matching ingredients as best it can. There was not an option for low sodium beef broth. Make sure you use that and low sodium tomato sauce. That should reduce the sodium quite a bit. Could I substitute the rice for quinoa? I am not sure. I have not tried. I will make it with ground turkey and leave out the cayenne pepper and sugar. This looks very good. I would like to try this, but could you tell me a way to possibly cut down on the sodium level? It probably does not have that much sodium in it. I use a program to establish nutritional information by matching ingredients as best it can. There was not an option for low sodium beef broth. Make sure you use that and low sodium tomato sauce. That should reduce the sodium quite a bit. Just found this recipe on facebook. Thinking about trying it tonight but cant think what side dishes I could serve with it. Have you any suggestions? That casserole is almost all inclusive. Mashed potatoes, applesauce, Pierogies, green salad with a light vinaigrette, crusty rye bread and butter. So much easier than regular stuffed cabbage and just as wonderful. Love this recipe! Turns out great every time. I am so glad that you liked it. We love this casserole! I guess your rice was already cooked? What temp for the oven? My husband is allergic to rice can I use cauliflower rice instead? I am not familiar enough with cauliflower rice to answer that. Perhaps one of my readers will be able to answer that. My daughter and her husband do the keto eating plan and therefore don’t do pastas rice and etc so we sub riced cauliflower in recipes and last week I subbed shredded zucchini in stuffed peppers for the rice and it turned out delicious so I will try this recipe as well soon and use one or the other in the place of rice. Thanks for sharing this one. I’m sure my kids will love it. You are most welcome! That sounds like a great idea. I hope you enjoy it!